IRELAND. . . National Heritage Museum... A docent says people once lived here in mud/grass huts. Huge flat stones mark a Celtic king's grave. 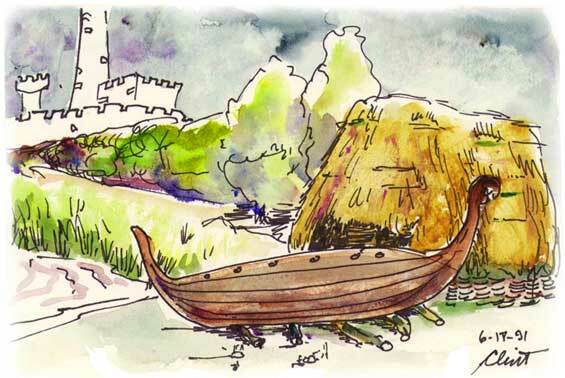 The Viking boat and replica castle recreate the ancient struggle for food and warmth. Irish people were raided, raped, and ravaged in hand to hand wars, looking the enemy straight in the eye. Wexford has many interests for tourists - castles, gardens, museums, galleries, nature reserves, a racecourse, beaches. But I want off the beaten path. My map shows Forlorn Point. I'll go that way after lunch.